Ever been asked that somewhat overused icebreaker question “If you could only choose one food for the rest of your life what would it be?” Well I have an answer. The potato. And cheese. Potatoes with cheese. That’s my answer. In my opinion, the potato is the most wonderful food this good, green earth gives us. You can do so much with it! Baked, fried, mashed… hello?? the french fry? All things delicious come from the potato in my opinion. My dear husband,however, finds potatoes to be starchy. I’m not sure what the deal with starch is, but I know Jeff doesn’t like to have a whole lot of it, which really puts a crimp in my potato side dish options. Place cauliflower florets in a large saucepan. Add chicken broth and bring to a boil. Cover and simmer until very tender, about 12 minutes. Pour cauliflower into food processor fitted with the metal blade. Add butter, cream cheese, sour cream, cheddar cheese, green onion, salt, and pepper. Pulse to combine. Reheat before serving, if necessary. I didn’t use the chicken stock to boil the cauliflower. I steamed the cauliflower instead. I possibly should have tried to dry out the cauliflower a bit like the recipe recommends as I found my mixture to be somewhat loose. I only added sour cream and cheddar cheese as I had guests that could not eat all the ingredients listed. I do think the green onion would be a delicious addition! You can make this a chuncky or creamy as you desire. I made mine creamy but think leaving it a little more chuncky could have been good. I thought these turned out pretty good! They tasted almost exactly like mashed potatoes, however the consistency for me was a little off. I think they turned out a bit more like instant mashed potatoes, but my guests for the night didn’t think so. 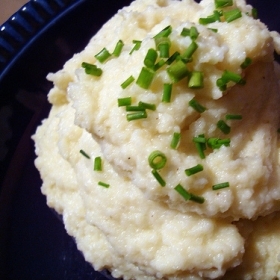 My Faux Mashed Potatoes will be making a reappearnce in the future! Another post about my love of Mexican food. We took a trip to Texas last week… the mecca of all things delicious. Our travels took us not on the interstate. Have you taken a trip like that recently? Not using the interstate? It’s really quite relaxing. The scenery is just nicer I think. Texas is pretty, but even prettier when you’re not on the interstate. As we drove along, passing through little towns, I spotted taco stands along the road. Ahhh, heaven. Ever had a taco from a taco stand? They aren’t the standard Taco Bell fare. It’s basically a delicious tortilla, steak and pico de gallo. And somehow the combination is wonderful. Heat a medium sauce pan with a tight fitting lid over medium heat with about 1tbs oil. Add 1/4 of the chopped onion and season with salt and pepper, then cook for 1 minute. Add the rice, stir to coat in the oil, then add 2 1/2 cups of the chicken stalk and bring up to a simmer. cover the pot, reduce heat to medium low and cook the rice for 15-17 minutes, until tender. While the rice is cooking, preheat a large skillet over medium high heat with 1 tbs oil. Add the chorizo and cook for 2 minutes. Add the remaining chopped onion, garlic, cumin, coriander and a little salt and pepper. Cook for about 3 minutes or until the onions start to get tender. Add the chicken and cook for 4-5 minutes or until cooked through. Halve the avocado, remove the pit and carefully scoop out the flesh. Cut the two halves into bite-sized pieces and transfer to a bowl. Add the halved tomatoes, jalapeno, cilantro, lime juice, salt and pepper and mix to combine. Add the remaining cup of chicken stalk to the skillet with the chorizo and chicken and bring it up to a bubble. Once it is simmering, add the black beans and continue to cook until the liquids are just barely visible and the beans are heated through, a couple of minutes. Once the rice is done, fluff with a fork. Please note you should only add 1/4 of the onion to the first small pan with the rice. Again, I don’t read carefully. I added the ENTIRE onion to this pan and only realized my error after I added the rice. Dang it! I attempted to remove the extra onion, but it was a lost cause. So I had to chop another little bit of onion for the meat mixture. It didn’t turn out bad though. I think this mistake is what gave the burritos the Chipotle flavor, since they season their rice too. Do you know how bad chorizo is for you? Holy smokes, that stuff will probably kill you if you eat it all the time. And don’t read the ingredients either. Not pretty. But it did make the chicken tasty. I did have a problem with my chorizo sticking to my pan. Maybe that’s just the way chorizo works… I don’t know. This was my first experience with chorizo. I think I may have missed the whole part about adding avocado. I don’t remember my salsa mix having avocado in it. Here’s a tip I learned from Curtis Stone on a great way to de-pit avocados. Slice the avocado lengthwise and twist apart. Take a large chef’s knife and (carefully) whack it into the center of the pit. Twist the knife and the pit should twist out too. This makes de-pitting much cleaner. The avocado has to be ripe though for this little trick to work. And you have to use a chef’s knife. Smaller ones haven’t worked for me unless the avocado is REALLY ripe. For all of Rachael’s words, her recipes are really easy to follow. I like that she’s pretty specific. The chorizo proved to be too spicy for Ava. Definite low point when I have to make something separate for her. I got jalapeno oil in my eye. All in all, I think we really like this recipe. The left overs were good, and it gave us our Chipotle fix for the time being! Summer has sprung my friends. I love summer. It’s my favorite season. Growing up in South Dakota, every summer my grandparents always had a big garden. They would plant it at our house because, living on a ranch, we had lots of space. I loved walking through the freshly tilled dirt with my bare feet, helping my grandpa plant the seeds and feeling the excitement of seeing the little seedlings sprout. I also loved sneaking into the garden when my mom wasn’t watching and nibbling on it’s wares later in the summer… peas, carrots, strawberries… yum! Several years ago, I tried planting my own little garden. The spot selected used to be a dog pen and the dirt was filled with lots of gravel. I worked for a week trying to loosen the ground and rid it of rocks. I didn’t have too much luck. I planted my seeds with little hope. Amazingly, my seeds actually grew. I had a plethora of zucchini, squash, cucumbers, and peppers that year. Had I had this week’s recipe then, more of my vegetables would have been put to much better use than what they were! For all my gardening readers, this recipe is for you and all your home grown veggies that are soon to be sprouting! To see the original recipe, click HERE. Place sausage in a large skillet over medium heat and cook until evenly brown; set aside. Heat 1/4 cup oil in skillet. Stir in garlic and onion, and cook until tender. Mix in zucchini, squash, tomatoes, bell pepper and basil. Dissolve bouillon in the mixture. Season with red pepper. Stir in remaining oil. Continue cooking 10 minutes. Mix pasta, sausage and cheese into skillet. Continue cooking 5 minutes, or until heated through. I don’t think you need to use 1/2 cup of olive oil. I had read some of the reviews for this recipe and someone had said the same thing, so I didn’t use the 1/2 cup. I didn’t actually measure my oil, but I can say, next time I’ll use even less. I probably used 1/4 cup to 1/3 cup and I thought it came out a little too oily for me. The tomatoes add enough extra juice that I don’t think a lot of oil is needed… just enough to saute the onion and garlic. Unless you really LOVE pasta, don’t use 16 oz. TOO MUCH PASTA!! Geez, I think I could have used half of the box and still come out ok. I didn’t have chicken bouillon granules. I only had cubes. I used four cubes. Using the 20 basil leaves as noted above is key. They provide the flavor for the entire dish. Don’t scrimp on the basil! I had forgotten to buy cheese and had asked Jeff to pick some up on his way home from work. In waiting for the cheese to show up, I probably cooked the veggies too long because they got a little mushy. So be careful to not over cook the veggies. The 10 minutes noted above is probably an accurate time. In a bowl, combine the turkey, garlic powder, fennel seed, sugar, salt, oregano and pepper. Cover and refrigerate for at least 8 hours or overnight. Shape into eight patties. Cook in a nonstick skillet coated with nonstick cooking spray for about 3 minutes on each side or until a meat thermometer reads 165 degrees F. Or crumble turkey into a nonstick skillet coated with nonstick cooking spray. Cook and stir for about 4 minutes or until meat is no longer pink. I only used 1 tsp of fennel and 1 tsp of sugar. Also I added crushed red pepper to make it spicy. I crushed the fennel and red pepper in a mortal and pedestal until the fennel was fine. I made mine the night before so it sat for probably 20 hours in the fridge. If you like a stronger flavor, I’d suggest following the recipe exactly as above. Leaving out some of the fennel made the flavor a little weaker, but I liked it that way. I loved all the fresh veggies! And the tomatoes and fresh basil made the entire dish. It had a light flavor that I like much better than using a heavy tomato sauce. I read that using fresh basil is key for this recipe and I’d have to agree. This didn’t take a whole lot of time. Start to finish was probably 50 minutes. If I had grown my own vegetables, I would have been over the top about this recipe! There is something satisfying about using the fruits of your labor. This recipe did make quite a bit. Not necessarily a low point because we have lots of left overs, but if you’re a single person, you may want to cut the recipe in half or you’ll be eating this for two weeks! I LOVED this recipe. I loved the turkey sausage, loved the basil, loved the veggies. If I had planted my own garden this year, I’d be in heaven.